METAdrasi’s cooperation with the American law firm Reed Smith for offering free legal assistance to beneficiaries of international protection in Greece was awarded the first prize in the category of “Award for Exemplary Partnership in the Public Interest”, in the “PILnet’s European Pro Bono awards” ceremony which was held in Amsterdam on Thursday 17/11/2016. 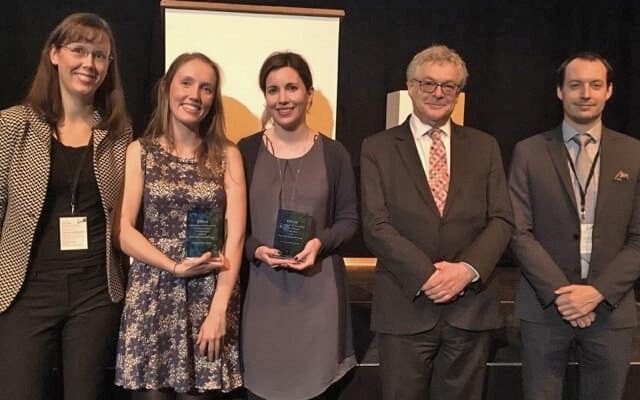 Each year, PILnet, Global Network for Public Interest Law, recognizes the best pro bono legal project undertaken as collaboration between an NGO and a law firm in Europe. “Reed Smith’s support was offered at a hard time when, due to the agreement with Turkey, thousands of refugees and migrants were trapped at the borders and we were looking for ways to augment our teams. Reed Smith’s help was extremely important: for 4 months, with 30 volunteer lawyers from different parts of the world and 30 interpreters assisting them, they were able to support our teams, particularly in Lesvos and Chios. The collaboration of Reed Smith with METAdrasi constituted an optimal cooperation practice between a Greek organization and volunteers. It yielded the maximum results because it was based on good organization, mutual respect, knowledge of the gaps and needs that required being covered daily, precise coordination and finally the selection of experienced volunteer lawyers. A big thank you to the volunteer lawyers and interpreters of Reed Smith for the help they provided at a crucial moment and to the tireless, exceptional Jayne Fleming, their Head and team Coordinator.